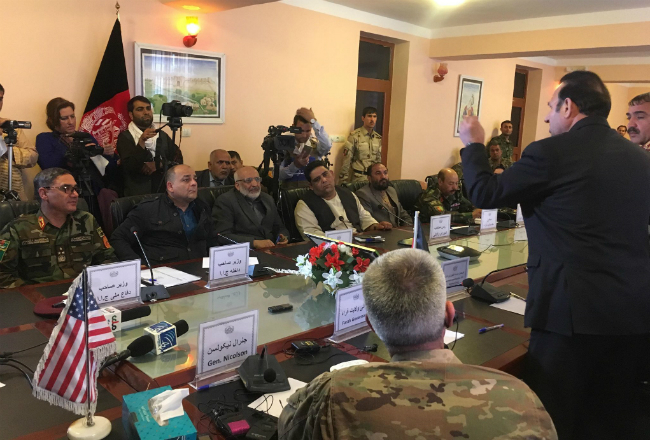 Four days after the Taliban’s attack on Farah City, a senior government delegation on Saturday met with representatives of Farah - a meeting covered live by the media - where they heard suggestions and complaints from the people and presented their report on how the attack happened. The Defense Minister Lieutenant General Tariq Shah Bahrami said the war in Farah is “a war over water” and that some countries in the region are trying to destabilize Afghanistan. He said heavy clashes are ongoing in 15 provinces and that government forces are sacrificing their lives every day. “War in Afghanistan has big dimensions. This is not the Afghanistan people’s war only. There are over 20 terrorist groups in the region and I want to say bluntly that they are supported by two neighbors of ours with all resources. They have other regional partners too,” the minister stated. Representatives of Farah including MPs and provincial council members said they want serious security measures enforced and a strengthened intelligence process for the province in order to prevent militant attacks. An MP from the province, Belqis Roshan, claimed that almost all districts in Farah have been captured by the Taliban and that the group will attack the city once the reinforcement forces return to Kabul. At the same event, Interior Minister Wais Ahmad Barmak said government forces continue their efforts to push militants back in 15 provinces in the country. Barmak said considerable changes will occur in the police within the next two weeks. He added that officials who have been negligent in Farah will be punished. “All police force members who remained in Farah and fought against militants will be awarded higher ranks. I have approved money for them too,” Barmak said. Meanwhile, the head of the National Directorate of Security called on the people to unite against terrorism. At the same event, the Resolute Support and US Forces Commander Gen. John Nicholson praised the Afghan forces for their bravery against the Taliban in the Farah war. “Farah did not fall and Farah will never fall. To the people of Farah, I tell you again we are with you and we are with all people of Afghanistan and we will stay with you until we bring this war to a peaceful conclusion,” he said. Nicholson called on the Taliban to accept President Ashraf Ghani’s peace offer. Farah representatives called on security heads to boost security measures and intelligence gathering in the province.